BANGOR, Maine –It is almost that time of year again: The 2017 Northern Maine Class B, C & D Basketball Tournament. Families and schools from all over Downeast, Central, and Northern Maine will unite at the Cross Insurance Center the week of February 17 – 25 to cheer on their local high school boys and girls basketball teams. I had the opportunity to catch up with Dale Duff from 92.9 The Ticket. Duff has been covering the basketball tournaments since 1974, when he was just a junior in high school. This will be the fourth year in the new Cross Insurance Center Arena. Anyone playing in the games this winter will have never played in the old gymnasium. Way to make you feel old. A lot of the public had something to say about the change in venue, but as for the broadcasters they have it easier, sitting closer to the floor, better acoustics, and not as loud as the old arena. The fans might beg to differ though. Chris Popper, a long time sports broadcasting announcer said he feels the new arena is “not as interactive” as the old one. “People can’t bring signs anymore, and that is very unfortunate.” He said. Nevertheless, people are getting excited for these highly anticipated games. Even snagged a few predictions from the broadcasters. Dale Duff ranked the Orono boys as the team to watch out for this year, and the Houlton girls to take the golden ball for the third year in a row. Bryan Stackpole, who also does broadcasting for 92.9 The Ticket, disagreed and said he thinks MDI Boys will take home the win, but did agree with the Houlton girls staying undefeated. Last but not least, Chris Popper stayed loyal to his MDI boy’s team saying they are the ones to beat this year, and jumped on the bandwagon with the Houlton girls winning it all. 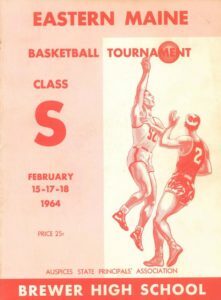 The Northern Maine Basketball Tournament is a long-standing tradition in Central and Northern Maine. It is something for the high school teams to look forward to every season. Families get excited about spending some time in the “Big City” of Bangor, and it a great economy booster for the Mom & Pop shops in the area. The Tournament has been coming to town since the 1920’s, and here to it not leaving us any time soon.